This is an 8 session comprehensive and step-by-step course to learn the Naskh script from absolute scratch composed of weekly lessons lasting up to 2 hours, with practice exercises and homework to complete between lessons to support and advance the skills learnt in the lesson. The participants will also complete a personal project during the course, at least one piece of Calligraphic Art suitable for framing and/or exhibition. Session 1: Introduction – Learning Method, Tools, Dynamics of the pen, Introduction to the Dot. Session 2: Naskh Day 1 – Introduction, Letters Aleph to ‘Ain. Session 3: Naskh Day 2 – Letters Fa to Hamza, Sample sentence scripting. Session 5: Naskh Day 3 – Sentence scripting. Session 5: Naskh Day 4 – Composing Calligraphic Art - Scaling, Dimensions, Measurements. Session 6: Project Day – Project Introduction ~ Planning and drafting masterpieces. 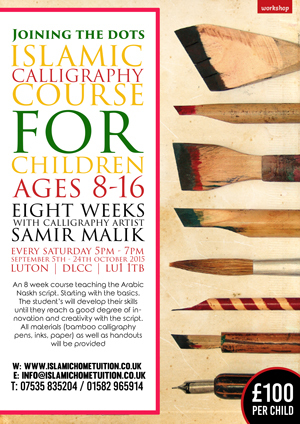 Session 7: Naskh Day 5 – Composing Calligraphic Art - Advanced scaling, dimensions, measurements. Session 8: Project and course conclusion. Attendance on the course along with ample practice and completing of the homework will result in the participants exhibiting confidence and competence in the Naskh style of Arabic Calligraphy by the end of the course. They will be ready to start creating their own calligraphy artwork.